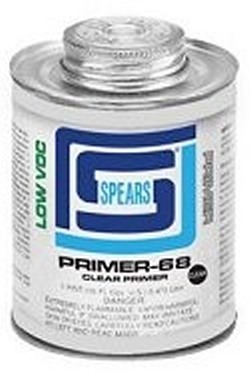 1 Quart, (good for 400-1000 glue joints of 1" pipe) of Spears CLEAR PVC Low VOC Primer/Cleaner. Meets NSF, IAPMO and ASTM D-2564 for glue. Leave purple color residue for easy inspection. May be Spears brand or Uni-weld. It will be purple color. Made in the U.S.A.